Webster University remembers Sister M. Cecily Jones (nee Margaret Blanche Jones), a Sister of Loretto, alumna and longtime faculty member. At age 93, she died peacefully the afternoon of July 18 at the Loretto Motherhouse Infirmary in Nerinx, Kentucky, in the 71st year of her life as a Sister of Loretto. A memorial mass for Sister Cecily, who many knew as Peggy, was celebrated July 29 at the Church of the Seven Dolors on the grounds of the Loretto Motherhouse. She graduated from Webster with a bachelor's degree in English in 1945, and later earned advanced degrees in both English and theology. Upon returning to Webster, she taught English courses -- her poetry course was a “bucket list” course for English majors -- from 1949-1961 and was also Dean of Women from 1955-1961. 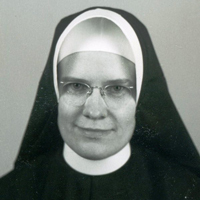 In that role, equivalent to Dean of Students, she resided in Loretto Hall, which at the time was a residence hall. Her thoughts and reflections on her time at Webster and as a Sister of Loretto were featured in several videos produced at the time of Webster’s Centennial celebration in 2014-15. (Watch her early in the following videos: Favorite Memories at Webster | People Who Made an Impact | Hopes for Webster's Future ). Portions of these interviews were among those shown Nov. 1, 2014, at the Founders’ Progressive Dinner, one of the opening celebrations to kick off the Centennial. Sister Cecily wrote extensively. She was a poet for most of her adult life. Her last book of poems, “Mostly for Promise,” marks the end of Loretto’s 200th jubilee year in 2012 and the beginning of Loretto’s third century as a community of love and service.